All of the posts under the "Latest News" category. Dear brothers and friends. We greet you from our place, in the work of God’s kingdom. We apologize for our lack of communication during this year, but want to give you a summary of what has happened so far this year. We started out the year with a group of eleven students: eight of them were students from previous years, and three were new students. 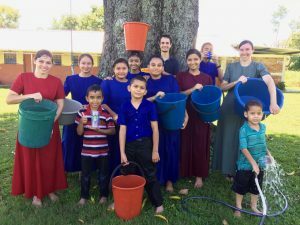 We had three teachers, and started classes with: Mayra Berríos (four students), Eliazar Rodríguez (four students) and Olivia Rodríguez, sister of Eliazar, (three students). This is Olivia’s first year of teaching. Kenia: a very intelligent girl, with a great desire to learn. She is 6 years old, the perfect age to learn easily. Deris: a shy child, but very intelligent. He is also 6 years old. Ana Silvia: is 22 years old, and is Deris’ sister. Having never attended school or left her small community, she is shy and fearful. For Deris and Ana Silvia the changes were very difficult. It was a total change of life: a new way of doing things, studying, living in a different household, learning to know new people, etc. It took a lot of effort from all the staff to help them adapt. 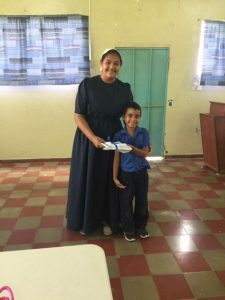 Deris, being younger, began to learn very well, but for Ana Silvia learning was more difficult, and since she felt very responsible for her little brother, she almost did not allow him to develop on his own. That affected the adapting process and their parents decided not to send them anymore. Kenia progressed very well, but after she got sick her mother also decided not to send her anymore. We were very sad that they stopped attending, so help us pray for them that next year their parents will send them to school. Teresa was the student that had studied with us the longest. She started attending our school when she was 6 years old and this year she turned 18. 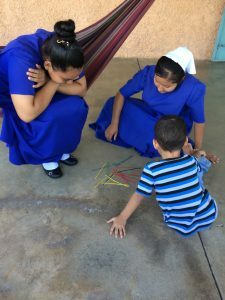 Shortly after her birthday she began to miss school, and one day she told us that she felt tired of school, of the church and she did not like anything from here; that now she had found other friends. She gave those as reasons to drop out of school; it was very sad for us. We communicated with her mother and she told us that she did not understand why Teresa had changed so much and that Teresa did not want to obey her either. Because of these changes, we had to rearrange classes, leaving Mayra with two students, Eliazar three students and Olivia two students. We have had the blessing this year that most of our staff are from our local El Salvador churches. 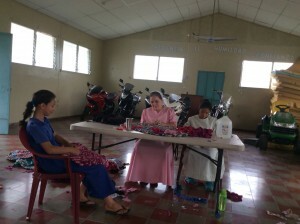 The three teachers are from the church in Texistepeque. 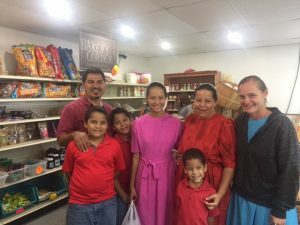 The dorm mother, who is Kendra Sandoval, is from the church of El Resbaladero, the dorm father is Juan Granadino from the church of Candelaria, and Kim Beachy is the cook and hails from the state of Virginia, USA. 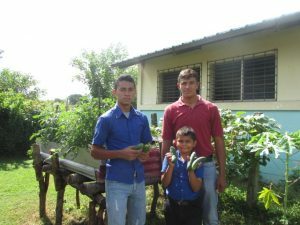 In addition to school activities, we try to teach the students some life skills, so this year, Eliazar and his students, with the help of Juan, did a project of planting vegetables. They managed to harvest some delicious tomatoes and cucumbers, which we could use in the kitchen. Another project we did, for the young ladies, was a rug making class taught by Rebecca Glick. She was here for a week and it very interesting to see the rug making skill acquired by the girls. It also spiked interest in some others, in making their own rugs. would take care of them. They grew very well and we already butchered one and are enjoying the meat. Despite the difficult times and daily challenges, we have felt the guidance, comfort, and protection of God on this ministry. We also appreciate the prayers and support of all of you! May God bless you greatly. The last couple months of school here have been busy. 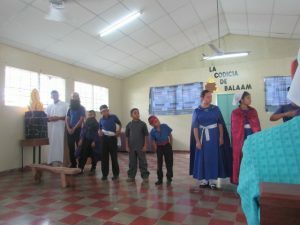 The teachers worked on making costumes for the drama and they and the students have been faithfully practicing for an hour every Monday, Wednesday, and Friday, learning their lines so that on October 27, they will be able to act out the chosen Bible story of Balaam and the Donkey. Myra planned a surprise birthday party one evening for when Maria turned 19 and invited all the deaf girls to stay the night. Maria was truly surprised and pleased, and we all had a grand time, sharing memories, eating snacks, and playing games that involved popping balloons. The students are feverishly studying their words for the final competition on October 20th and are all excited to be almost done with school. Thank you for your support and prayers throughout the year, and please continue to remember all the deaf the next few months during their “summer vacation.” God bless each of you! We would like to share with you a few of the blessings that God has given us as a family. 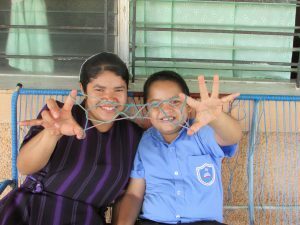 At the beginning of this year, we received an invitation to go and help with the annual Deaf Camp in Chihuahua, Mexico. Since we had been there before and made friends, we really wanted to go. But we also wanted to try to get visas to be able to visit the States. After preparing many documents, and after lots of prayer, it was a miracle that we were able to get visas for the whole family so we could go to Mexico and the States! We left home on July 17, traveling four days in our vehicle till we arrived at our destination, Los Jagueyes. On the way, we enjoyed eating Mexican food and seeing the many different sights – mountains, planted fields, deserts, and long roads that never seemed to end. One of the blessings was that we were able to pass 8 or 10 police checkpoints without being checked. One night we arrived in a city and stopped at 10 hotels without finding available rooms! But after praying, we found a hotel with one last room available on the highest floor. Praise God! The week of the Camp was a huge blessing, sharing with both hearing and deaf friends. Natanael preached two times every day, Sunday through Friday, in addition to giving two classes daily. I taught one class a day for a group of married women. My sister, Maria Eva, who works at Shining Light, in Tecate, came to meet us there and help our children with their schoolwork. It was a time of counseling, encouraging, sharing struggles, and receiving encouragement from others who work with people from the deaf culture. We left Mexico for the States on Tuesday, August 1. 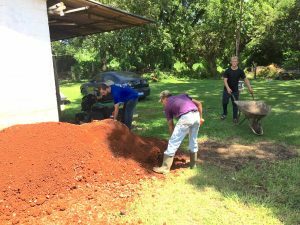 On Wednesday, the second of August, we arrived in Oklahoma at the house of Gamaliel and Juanita Aguilar and were there till Saturday, the fifth. We enjoyed the time with family, and the children were able to have fun with some of their other cousins. Saturday morning we left for Kansas and went to the house of Willard and Sharon Mast. That night we had supper with friends that we had known before in El Salvador. It was a great time of sharing memories. We really enjoyed our time with the Mast family. The children especially remember the ice cream. Monday, the seventh, we left for Indiana, arriving at midnight at the house of my aunt, Rosa Guadron. We had the privilege of staying in the house of my cousin, Raquel, who was with her family in El Salvador. We spent time with Caleb and Sandra Mast, who had previously worked in the ministry here. We visited with the Bontrager family and other friends. On Wednesday Natanael was able to share in the church of Rosewood about the deaf ministry here. Our children also made memories, playing in the lake, and Cliffton celebrated his eighth birthday. 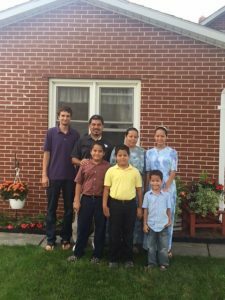 On Saturday, August twelfth, we arrived in Ohio at the house of our friends, James and Noemi Yoder. 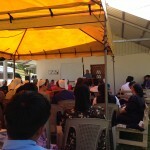 On Sunday we went to church with them, and Natanael again shared about the ministry here. We visited with other friends and were able to experience riding in a buggy. Monday, the fourteenth, we were headed to Niagra Falls, and on the way we visited Delila Miller, the first cook that worked here at CICS. We had a good time seeing Niagra Falls and witnessing how powerful our God is and how beautiful he has created our world. On the way back we went to visit our friend, Marta, in Pennsylvania, who had also worked here before. Later we were guests of Juan Carlos and Melody Trejo, who used to be from our church and who also worked here at CICS. The next day we visited Samuel Stoltzfus, who worked here at CICS, and other friends as well. We left for Virginia on Friday the eighteenth, headed to see Chico, another of Natanael’s brothers, and on the way we had supper at the house of Melody and her husband. Melody had also previously worked here at CICS. At midnight we arrived at Chico and Marleni Rivera’s house, and on Sunday, the 20th, Natanael shared at Faith Christian Fellowship, where Chico’s family attends. We also visited Washington, D.C., and made more memories. On Monday, the 21st, we visited with Samuel and Miriam Amaya. On Wednesday we went to the Ark in Kentucky. Once again we could see how God is a God of immense projects and uses humans like us to accomplish them. Friday, the 25th, we arrived back in Oklahoma and had a weekend very full of preparations for our trip home. On Sunday we attended Cimarron Christian Brotherhood, and in the afternoon we headed to Dallas to visit Tatiana, one of Natanael’s nieces. The following day we went to visit Tim and Sonia Glick and their family in Texas. Tuesday, August 29th, we began our trip south. That same day we crossed the border to Mexico without having any problems or having to register our things. Praise God! The following day we started to travel through Mexico, full of enthusiasm, since we wanted to be home already, but a few hours later, we realized that we’d lost a small suitcase off the back of the vehicle. We went back to look for it, but after awhile we decided that it’d be better to continue with our journey. We’re thankful that we didn’t have any really valuable things in that suitcase. We arrived at the El Salvador border on the afternoon of September 1st. We were a little afraid that we’d have problems or have to register our belongings at the border, but we prayed, and praise God, we passed through without problems and without even getting out of the vehicle! Glory be to God! We were away from home for seven weeks. This trip was a blessing and a gift from God. Thanks to everyone who made it possible and shared with us. God bless you! We are going to treasure our memories of this trip for a long time. And you’re welcome to visit us here, too, at any time. The boys’ garden is doing well – they have harvested radishes and many cucumbers, and there are small green orbs dangling from the tomato plants. 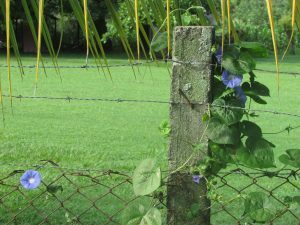 The papaya trees that Veronica started from seed are now quite large and beginning to flower, and the coconut palms are loaded. The corn in the field next to us was harvested as well, and the children all enjoyed watching the tractor and tiny combine chop the corn stalks into silage. Like the verse from Psalms says, sometimes we have felt like shedding tears of frustration at Miguel’s disobedience, but he has actually been doing better this last month. It is so rewarding to see progress! And speaking of progress… On July 28 we had our second spelling competition, and this time the students all came, and all did well. In Eliazar’s class, Eduardo scored higher than Joel, making him pretty happy, and in Myra’s class of girls, Beatriz actually won! That was super exciting for her, since either Paola or Teresa has won for several years running. But we think that Paola has been spending too much time on her new phone, which is why her grades are down and Beatriz was able to win. Please pray that she would understand how important school is and have the wisdom to use her phone and manage her time accordingly. 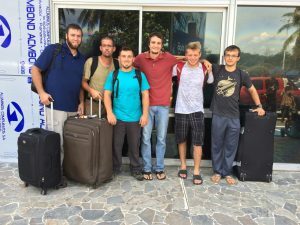 On August 8th, Darin Hershberger left for Haiti to continue his work with Open Hands ministry there. We will miss his diligent handy-work around the place, since he was constantly fixing or improving something or other. He was always good at interacting with Carlos, a former student who is still in the area, and he also enjoyed a good game of Skip-Bo with the rest of us staff. Nata and Becky Aguilar, the director and his family, took a six-week vacation to visit family and friends in Mexico and the States, leaving July 17 and returning the end of August. 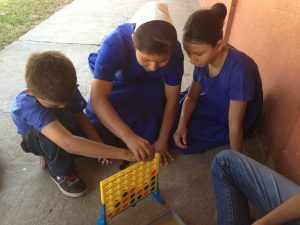 They attended and helped teach at a weekend retreat for deaf adults while in Mexico and were joined by Becky’s sister, Maria Eva, for part of the trip. Roberto and Ruth Ramirez, Dorm Father and Teacher, did a great job of being in charge during their absence, and we all pitched in to help out when needed. 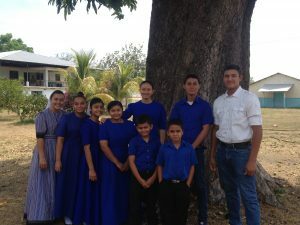 One Saturday, the 19th of August, we staff, along with Maria, Teresa, and Eduardo, our oldest students, and Elmer (former student/staff) drove to a coffee farm, recently purchased by the churches here in El Salvador, for a work day. 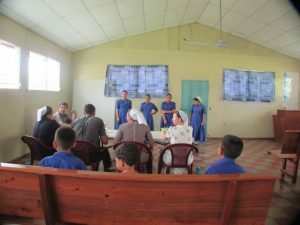 The Committee hopes to build facilities in the near future and be able to host Retreats and Bible Schools, saving the expense and trouble of finding and renting some other place. So for the work day, some of the guys sprayed the coffee trees with bug and disease repellant, and we girls helped spread fertilizer around the base of the trunks. It was a lot of ups and downs, since they plant the steepest hillsides along with the flat of the valleys here. 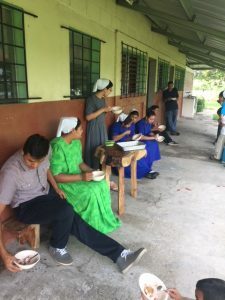 Since so many people had come to help, we finished by noon, and the group of ladies in charge of lunch had made big pots of rice and beans, along with cream, fresh cheese, and tortillas to satisfy our hungry bellies. We all sat around in the shade while we ate and then chatted for some time before packing up to head home. On Monday, the 21st, our pig, George, died. Somehow he’d gotten a hold of and eaten the shells and seeds of a fruit called anona, which is apparently poisonous. We are all very sad and disappointed at his abrupt end, for he was growing quite big and fat. That Saturday we staff, along with Teresa and Zulma, a former student, took a day trip. 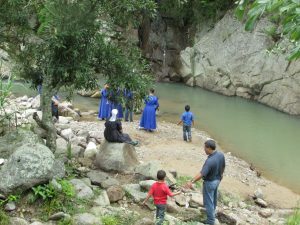 We swam and picnicked at a tall, beautiful waterfall in El Salto, saw the ocean from a winding road along the coast, driving through several tunnels where the road went through the mountain, and even stopped at a fishing pier in La Libertad. We walked the length of it, saw and smelled all the various fish for sale, and watched a fishing boat come in off the ocean as the sun was going down and get hoisted up to the pier by a winch. The fisherman started selling their fish right away, and people crowded around to pick out what kinds and what sizes they wanted. We all had a great time and were thoroughly tired when we finally arrived back at CICS. As we look forward to the last two months of school, we are extremely grateful to God for his protection and many blessings up to this point. Thank you all for your support – whether through prayers or financial aid, both are very necessary and much appreciated! At the beginning of June, Joshua Miller – son of CICS Board member, Joseph – spent several days here. 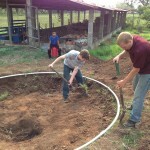 He helped Eliazar and his class to construct an enclosed box several feet off the ground that they filled with dirt. 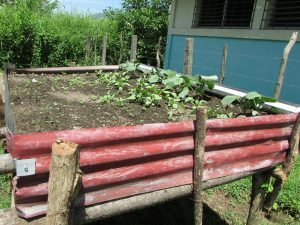 Roberto bought seeds, and then during the last week of June, Eliazar, Eduardo, and Joel planted cucumbers, tomatoes, radishes, and green peppers. With all the rain, the plants will hopefully sprout and grow quickly. 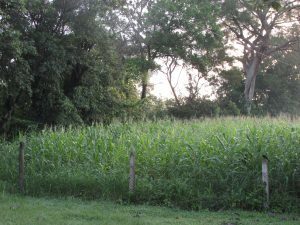 The corn in the field next to us is also growing rapidly and is about to tassel. Darin replaced the trampoline fabric, and that location is once again a hot spot. Literally as well as figuratively, when the sun is out. One day it rained very hard during the final recess, and the teachers and students who were playing a running game got completely soaked. Becky refused to let them in the house for lunch, so we set up tables out on the porch where their soggy clothes could drip onto the concrete. That was a fun and unusual diversion from our normal routine. On the 20th we had visitors, four high school girls from Pennsylvania. Makayla Ressler and Alyssa Groff spent the day here, helping Veronica in the kitchen, and the other two girls, Kelsey and Marianna, spent the morning at the hearing school, helping the teachers grade papers. They arrived here at CICS during the devotions after lunch and later recounted their adventures. One of the teachers took them out to eat for lunch, asking if they were okay with eating a torta, which is pretty much a sub sandwich. Although they knew some Spanish, the poor girls could only remember the word tortuga, which is turtle, and thought they were being asked to eat turtle meat. Bravely, they consented, and ended up liking the sandwich. After we’d explained what torta means, we all had a good laugh. On the 21st, Samuel Stoltzfus came for a visit. A former teacher, his arrival was greatly anticipated by all. He distributed Shutterfly picture books full of memories to each of the students and brought candy for the current staff. We played many games together and reminisced of happenings in past years. 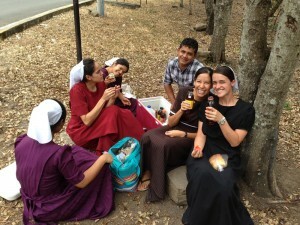 The weekend of the 22nd through the 24th was the annual Youth Retreat here in El Salvador. 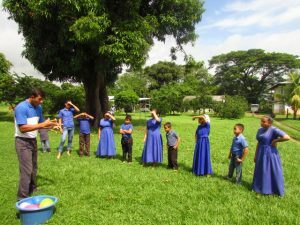 This year it was held at San Ignacio, Chalatenango – a beautiful location with rustic log cabins and many flowers – and five of our deaf girls were able to go: Veronica, Zulma, Maria, Teresa, and Beatriz. 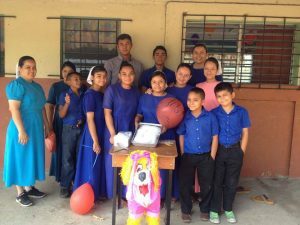 It was extra work to interpret all the messages and activities for them, but they were super excited to be included, and they were able to learn many new things. 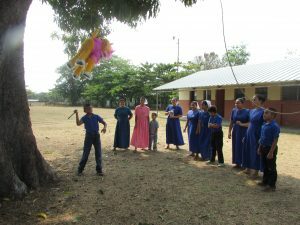 Everyone’s favorite activity was volleyball, during the short breaks between the messages and in the evenings, and on Fri. evening some of the youth sang together for an hour. Some of the topics were Technology (How to use it Correctly), The Life of King David, How to Obtain a Crown of Glory, and the split classes taught by Nata and Becky Aguilar were How to Begin a Relationship, for the guys, and Developing Character and Waiting on God’s Will, for the girls. Beatriz’s sewing frenzy lasted until she’d finished sewing her first dress, cut out, and sewed a second one. She had wanted to have new dresses for the Youth Retreat and was very happy to accomplish her goal. Now she is busy studying for the various math, science, and word tests at school. 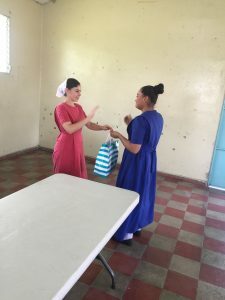 On June 21st, thirteen-year-old Paola talked to Becky about what it means to be a Christian and prayed to give her heart to Jesus! We are all rejoicing at this step of faith she’s taken, and we covet your prayers for this young, new Christian. None of her family supports her decision – her father is a baker, and she says that her little brother, Stephen, steals the little bit of money she tries to save. But she has a sensitive heart and wants to do what is right. Pray for us as we encourage and teach her. Miguel continues to struggle with his numbers. Ruth gives him sheets of paper that have mostly blank rows with only one or two numbers filled in, that he needs to finish filling out, and the repetition is helping him a little. Often at the supper table, he’ll gaze around intently, his brown little fingers moving as he counts up the people. 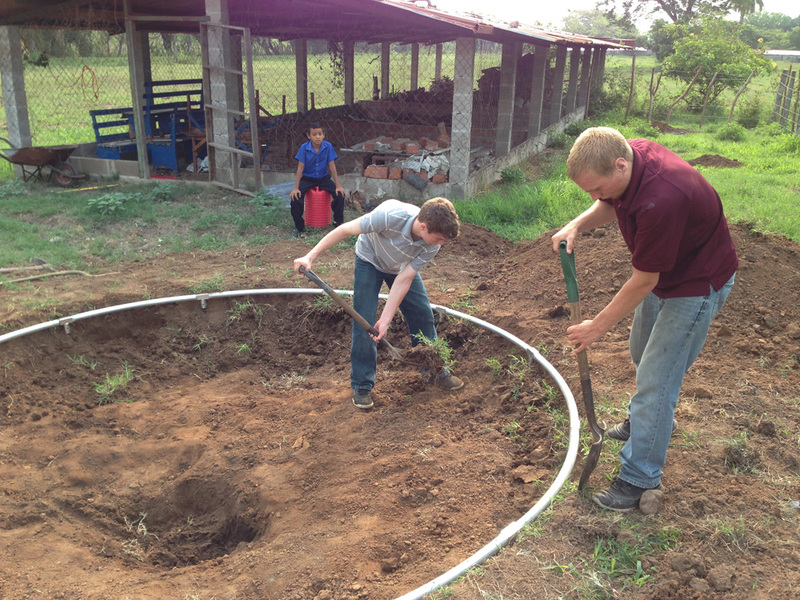 Roberto, Darin, and Miguel have been working to clean up the area where we kept a pig last year, and on Tuesday, July 4th, Roberto brought another little pig to stay in the pen. An energetic, snuffling little thing. Miguel helps clean the pen and give it food, and he likes to imitate how it eats. He is every bit as noisy as the pig itself. On July 13th we all took a field trip with the students to La Palma, a campground sort of place with cabins. 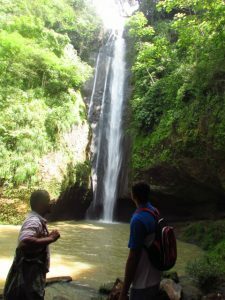 The teachers had each planned a game with prizes, including relay and sack races, and after eating sandwiches, veggies, and cupcakes for lunch, we walked ten minutes down the mountain to a river. There was also a waterfall, so the girls all posed for pictures with each other, and the little boys all rolled up their pant legs and had a blast throwing rocks into the water. It was a fun and memorable day. Praise God for his continued provision and protection! We’ve had colds and other sicknesses, but God had given us wonderful bodies that eventually heal themselves with proper care. Thank you all for your prayers and support! The rains have come and the grass is green, growing, and needing to be mowed constantly. The accompanying insects and flies annoy us all, but we put up with them, since we can’t have one without the other. Myra’s friends, Daisy Oviedo and her daughter, Evelyn, came for a visit from Honduras toward the end of April. Evelyn holds the record around here for how fast she learned an amazing quantity of sign language, and Daisy sewed numerous dresses and aprons for Myra. It was fun having them here! Eliazar’s sister, Olivia, was also here to visit for a week. 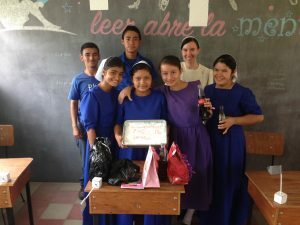 On April 26th, Teresa turned 17, and we all had a grand party during recess – water balloon fight, cake, and a piñata in the shape of a dog, suspended from a branch of the enormous mango tree by the classrooms. One weekend shortly afterward, Becky’s sister, Mary, was here from Mexico for a visit, and Paty Vasquez and her sister Nancy came for a couple days. Paty was a teacher here last year and the year before, so we were all happy to see her again. Nata wanted to have a meeting with the teachers, so Mary and Paty corralled the students for a devotional in the Chapel and afterward we all played a couple games – something similar to Dodge Ball, and then a relay race, holding spoons in our mouths to carry lemons across the yard and back. The hardest part was transferring the lemon to your partner’s spoon without dropping it, especially since you weren’t allowed to use your hands! We held our first spelling competition on May 12th. 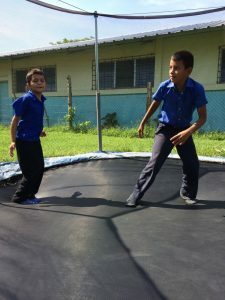 Seven-year-old Antony didn’t come, and the other boys in his class, Jairo and Miguel, didn’t do well enough to receive prizes, but all the other students did. 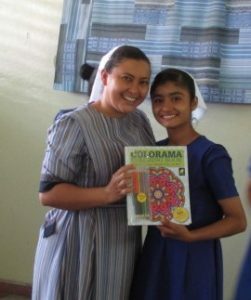 The scores for Myra’s class of four girls were all very close, even Maria, who only started coming to school last year! 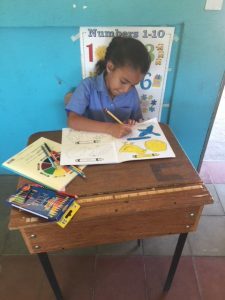 Each class takes a written test of the words they’ve learned, and then they take turns either finger-spelling words or trying to recognize words when their teacher spells them out. The students and teachers all get plenty nervous, but giving and receiving prizes is fun! Bethany started giving cooking classes several weeks ago. Every other Monday, 18-yr-old Maria, 16-yr-old Teresa, and 13-yr-old Paola take turns (they’ve each had one turn now) staying over and learning how to make cookies. Paola has hardly had any experience in the kitchen but is a fast learner, and Maria is even faster, since she does have some cooking experience. Both of them have a very healthy fear of the oven, explaining that they only have a stovetop in their house. 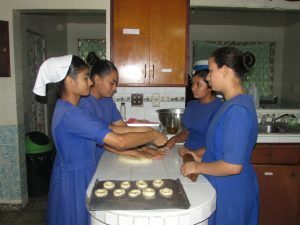 They are both excited to be learning to bake, and Bethany helps them practice reading (the recipe) and arithmetic. The girls have taken some cookies home each time so their families can see and taste what they’ve made. It’s a joy watching them learn and improve throughout the rest of the year. Paola says she also wants to learn how to sew. Bethany had been helping Beatriz sew a dress of her own, and although she usually didn’t get very far in one sitting, she is definitely improving. When it was Teresa’s turn to come and make cookies, we ended up being out of flour, so she cut out and sewed a dress instead, finishing all but the zipper. With Teresa busy sewing, Beatriz was inspired to sew more as well, and now her dress is also close to finished. Several people have been sick the last few weeks. Becky, the director’s wife, says that during the rainy season when there are lots of flies, people get sick easier. One Saturday, the staff went with a few other folks from church to pass out Christian literature at the market in Aguilares, the closest town. That was a good experience, and afterward, during lunch, we staff discussed people’s responses. On the whole, people were much more friendly and receptive here than on other occasions when I’ve passed out tracts in the States. This past week Juan Carlos Trejo, a former CICS staff member, flew in from the States with his wife and son for his father’s funeral, and some people from here went to the funeral to see them. They were also at church on Sunday, and he preached the message, sharing some of his story and encouraging us to be prepared for whatever God brings our way. 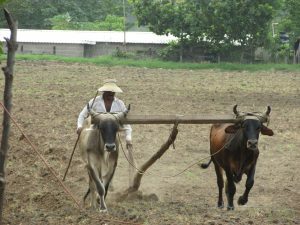 Two weeks ago, Becky’s father, Saul, and his workers came with a yoke of oxen to plow furrows and plant corn in the newly-disked field beside us. 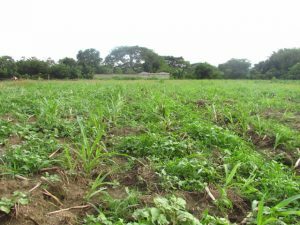 Spurred on by all the recent rains, the green shoots are pushing high, stretching away down the length of the field in somewhat uneven rows. What an amazing God we serve – the Author of all life! Here at CICS we’ve started a new school term, with the same students as last year and some new staff. 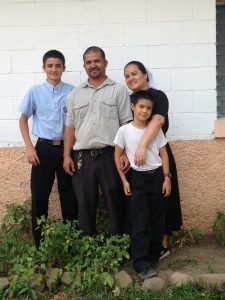 Roberto and Ruth Ramirez have two sons – Roberto Jr. is 14, and Dorian is 9. They live in Casa Twila, the little house past the shop. 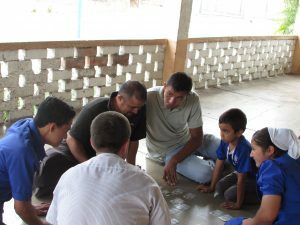 Roberto works as the Maintenance Man and Dorm Father, overseeing Miguel in the afternoons, and Ruth teaches the youngest three students, 9 yr. old Miguel, 9 yr. old Jairo, and 7 yr. old Antony, although the last two have not been coming to school regularly. 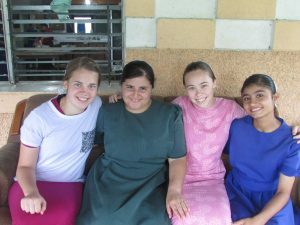 Myra Berrios is teaching the four teenage girls – 18 yr. old Maria, 16 yr. old Teresa, 15 yr. old Beatriz, and 13 yr. old Paola. Myra worked here at CICS as a cook five years ago, so she already knew sign language and she loves to tease everybody and make strawberry shakes for us in the afternoons when it’s so hot. I fear the strawberries will soon be gone, but then she’ll probably make mango shakes instead. Eliazar Rodriguez is the third new teacher, and his class consists of 16 yr. old Eduardo and 10 yr. old Joel. 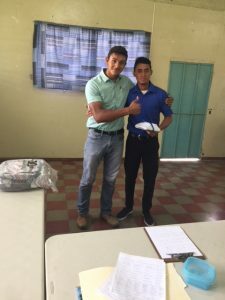 Eliazar often gets teased about having to duck through doorways because of his height, but his energy and example will hopefully help motivate Eduardo to do better at his studies. Veronica Rosales is cooking again this year, and she does a fabulous job of it! 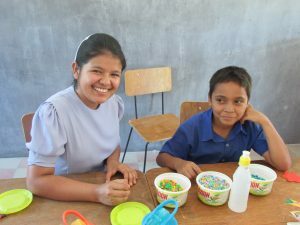 Her choco-bananas (bananas frozen on popsicle sticks and dipped in chocolate coating) are always a favorite with the students, and 4 yr. old Dwight Aguilar loves to help her measure flour when she makes bread or cinnamon rolls. She often takes time to work outside as well, weeding or watering the flowerbeds. Bethany Thompson is again working as the Dorm Mother, helping Beatriz study her words and other homework, teaching her to sew a dress of her own, and listening to her stories of what happens at her house over the weekends. David Glick is teaching English to the hearing students at the church school again this year. Nata picks him up every Monday morning, along with Beatriz and Miguel, and he has classes Monday and Tuesday afternoons, and then buses home on Wednesday. It’s good to have him around – he worked as Dorm Father for the second half of last year, in addition to his classes, so it feels like he’s part of the staff here. Also here at CICS is Darin Hershberger, working with Open Hands Ministry. He’s using CICS as his home base between visits to different countries. From February 23 to March 23, he was in Mexico and Haiti, and this weekend he’s planning to go to Guatemala. While he’s here at CICS, he helps Roberto with maintenance work and joins heartily in all our games after supper, sometimes counting his cards in Creole (the language spoken in Haiti). He worked here as a Dorm Father several years ago, so he knows a good bit of sign language as well. School commenced on February 8th, and we had classes for a week and a half, but on the week of the 20th, there was a ministers’ conference here in El Salvador, so we didn’t have school. Nata Aguilar, the director, was in the States from March 8th to March 22nd, and the day after he returned, our water pump broke. We had no water from 7pm Thursday night until 11:30 the next morning. Since water is fairly essential, Nata took his truck over to the church to fill and haul back a couple of barrels. Becky and the children, and Myra, Eliazar, and Darin went along to use the rarely-used shower stalls in the bathrooms at church. We also had two visitors from the States, Heather Sensenig and Janessa Martin. They sewed curtains for Myra’s classroom and bedroom and played with the children at recess and after lunch. Miguel and Antony especially soaked up the attention, showing off and misbehaving even more than usual. Their teacher, Ruth, says that they don’t obey or pay attention well in school, and they are very behind for their age, easily forgetting what they’ve been taught the previous year. Miguel’s homework one day was a page of math problems, addition and subtraction, using the numbers one through seven. Veronica tried to help him by giving him seven toothpicks and telling him to physically add or subtract, and then count up the rest for the correct answer. Visualized in that way, he was able to figure out each problem, but more often than not, he would just try to guess, or sign, “I don’t know, I don’t know!” So Ruth is a little frustrated, reluctant to move forward until Miguel has mastered the basics. Spike Ball, and Trashcan (or Twelve) with Skip-Bo cards are the new favorite games to play after supper here, and we’ve also been playing Skip-Bo and Dutch Blitz. When trying to explain to Joel how to play Spoons, Myra told him he needed 4 cards of the same number, so he was trying to get four of the number 4 and didn’t pay attention when everybody grabbed for the spoons. It took several rounds to get him to understand that he had to have four cards of any number and that he needed to watch for when someone grabbed a spoon. Myra has been teaching her girl students about pronouns and conjugating verbs. The concept has been difficult for them to grasp but will greatly improve their reading and writing abilities. When signing, there is not much distinction made in the way you say, I run, He runs, We run, etc, but when reading or writing, there is a very necessary and important distinction, and if they can learn this, they will be able to read and write much more fluently. As it is, they struggle to read their Bibles, and when they write notes, we struggle to understand what they’ve written. This past week, we’ve had an outbreak of colds and sore throats. Sniffles and sneezes all around. But praise God for our usual good health! Thank you all for your prayers and support. May God bless you! Greetings in the name of our Lord, Jesus Christ, the owner of this ministry. In one of our devotional times as staff, we were reminded by 1 Corinthians 15:58 that we should be steadfast, or constant, in the work of the Lord, because it is not in vain. Many times the devil wants to make us discouraged, but we have the promise that someday we will see the fruit of our effort in serving God. In the last months we have had some difficulties among the students in their relationships with others. Many times we have had to help them choose right, and thank God, His Spirit keeps working, breaking lives, and although we do not always see great changes and we are not sure if they understand everything, we trust that God can complete the work of transformation in their lives. We have had the blessing of visitors since the beginning of the year. Thanks to everyone for your help and encouragement for us and the students. Anita Byler and Marla Graber, thank you for the curtains you made for the classrooms and church house. Ivan Glick and Shawn Lapp did a good job chopping down the weeds and putting gravel on the lane. 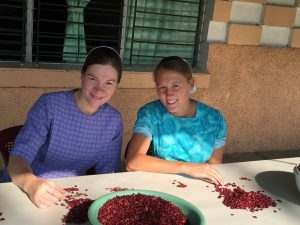 Leandra Dueck and Regina Reiff, thanks for your help in cleaning beans and with the activities with the schoolchildren. Lavelle Beiler, Jonathan Peachey, Matt King, Steven Glick, Darren Stoltzfus, thank you for your wonderful work in cleaning up the back part of the property, tearing down the old buildings and cutting down trees. May God bless each one for your great effort and all the work you accomplished! We also had the privilege of having the parents of the students here, to report to them how their children are doing in their studies and conduct. It was good for the parents to see what their children have accomplished and also the needs they have, and see how they can help them. We have also had a visit from ISNA, the government agency responsible for the children’s welfare in El Salvador, (Equivalent to Social Services in the USA). It is strange, but they have visited us three times this year and they always have observations to share with us, some simple and some that have us a bit concerned. We ask for your prayers, because they want to come next month to give us some teaching on a certain law. We are approaching the end of another school year and there is much work to do. Pray that we can continue putting forth effort in serving the Lord. Greetings again from CICS. Just a few lines to let you know what has happened in recent months. We ended the 2015 school year and at the closing program the students acted out the story of the Biblical character, Naaman. Our desire was that all those in attendance could learn of God’s great power. It was a joint effort of both the students and teachers that turned out well. 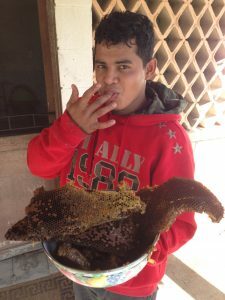 Mauricio, who was a student since he was eight years old, graduated this past year. He will be greatly missed as he was a model student. I think none of his teachers had complaints about him. We are glad that he is a young man that loves the Lord and is faithful in attending services at the local Mennonite Church and hope to see more of him. Sadly, because of bad conduct, two of our students were suspended from school and didn’t finish out the year, namely Silvia and Carlos. Silvia struggled with wanting to take her own way and after talking with her mom, we decided it was better to have her terminate before the school year ended. 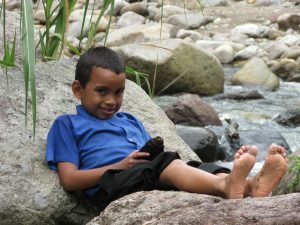 Carlos decided that a life of freedom would be best and left the Strong Tower Children’s Home. At sixteen he feels old enough to live on his own; things haven’t really worked out for him and he has lived with some of his former classmates but does not want to be responsible in helping out with anything, so his stays have been short-lived. Also three of our volunteer staff terminated at the end of 2015: Matthias Beachy, Melody Eash and Lidia Alfaro. Their respective service was: four, three, and one year. We appreciate their effort and dedication and desire the Lord’s blessings on their lives; may He add His reward for the service. This brings us into the 2016 school year. We thank God for the opportunity of another year. 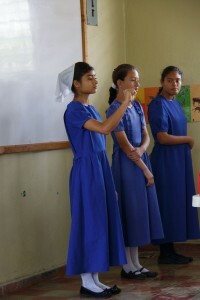 Classes started on February 8 with 9 students; 8 have been part of the school, before, and one new girl. 3 more students were expected to attend, but unfortunately their parents decided not to send them. Hopefully by next year their parents will see the value of their children receiving an education. The teacher of the first class is Liz Jara. 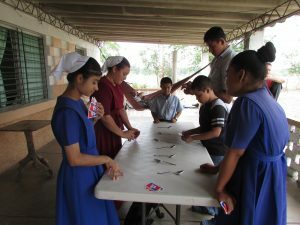 It consists of two students: Maria who is 17 years old, but is attending school for the first time, and Antony, a 7 year old. This is a big age difference, but they are almost on the same academic level. Antony studied last year, but unfortunately he missed a lot of classes and that delayed his learning. 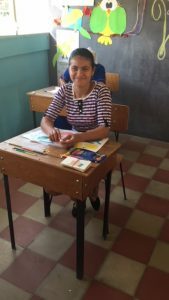 Maria is in her first year at school, but is eager to learn, attends school every day and is very attentive in class; it seems as if she wants to learn everything she missed out on, in previous years. 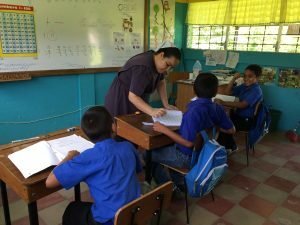 Paty Vasquez is the teacher of the second class and this is her second year teaching at the Deaf School. 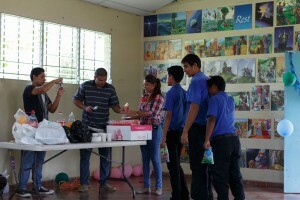 Her students are: Joel, Jairo and Miguel, and they are between eight and ten years old. These boys keep their teacher hopping. They are all high energy and need lots of love, discipline, correction, and teaching. And for the third class, the teacher is Samuel Stoltzfus and his students are: Teresa, Paola, Beatriz and Eduardo. Teresa is at a more advanced level, then Beatriz and Paola are on the same level, and Eduardo is the less advanced of the class. 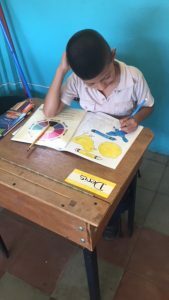 That gives you an idea of how much effort the teacher puts into preparing classes that are relevant for the different levels of learning; but he does very well and, although the students say he is very strict, I think they’re learning a lot. Bethany Thompson is the Dorm Mother and this is her first year at the school, which means that she is learning Spanish and expanding her Sign Language abilities. 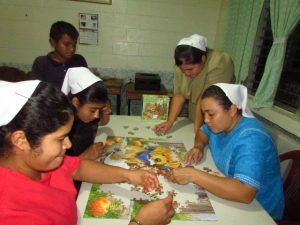 She is responsible for Beatriz’s care in the afternoon and helps her develop life skills. Veronica is again back in the kitchen this year and has the big job of feeding many hungry people. Elmer is again in charge of maintenance and in the afternoon is responsible for Miguel, helping him learn different skills. Thanks to each of you for your prayers and financial support, it is a great blessing to have what we need for each day. May God reward you greatly! What’s been happening at CICS? 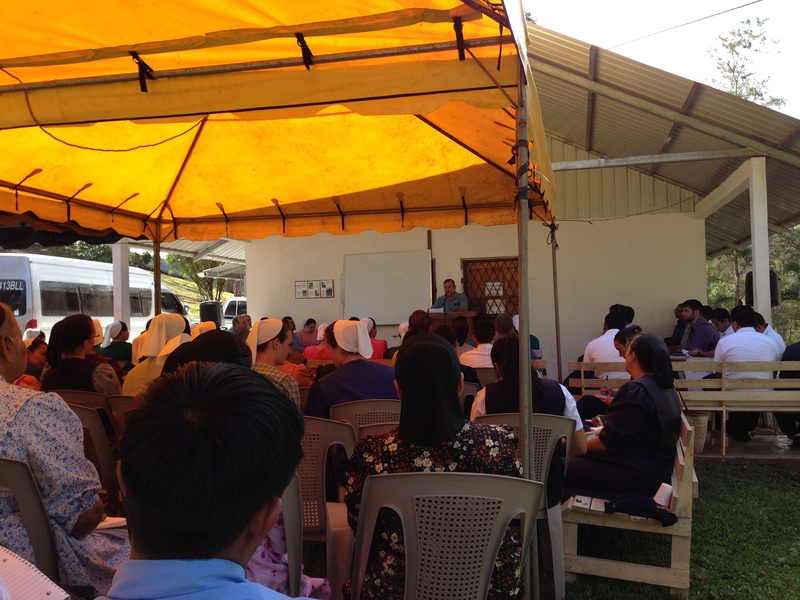 Well, at the end of March, the 24-26 specifically, the staff had the privilege of attending a Central American teachers’ meeting in Nicaragua. It was a time of learning, sharing, and meeting others, along with a bit of adventure. Our family enjoyed a time together as a family. After that came a week of Easter vacation. Each worker had their different activities. After the break, everyone was ready to continue with normal work. In April, a few of Samuel’s siblings visited. 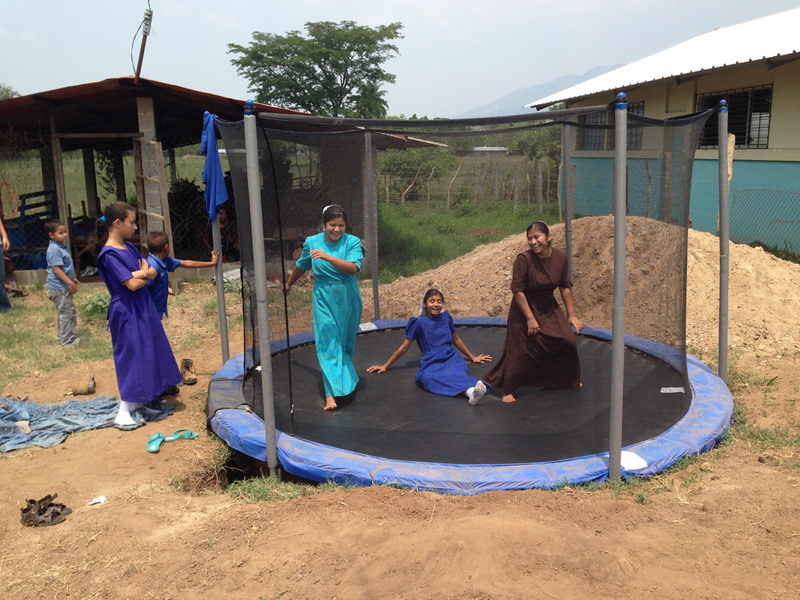 They came planning to install a new plaything for the children–a trampoline! We are grateful to the boys for their work. The children and adults alike have enjoyed it very much. Although there have been a few minor accidents, it continues to be the biggest attraction for the children at recess time. We also enjoyed a visit from some of our former staff, namely, Caleb and Sandra Mast. They were here a few days, and it was good to remember times gone by and see changes that life brings, including a new addition to their family, baby Desmond. We say thanks for the invitation to eat at Pollo Campero. It was a good time of making memories. The month of May was full of activities. 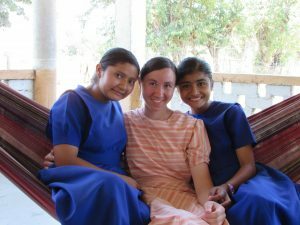 We had Rebeca Glick here for a week to teach some of the deaf girls how to make rugs out of pieces of material. It was beneficial in opening their minds a bit to something else that they can make with their hands. We thank Rebeca for her work. Matthias’ brother came all the way from Africa to visit. Also there was a group of youth from a Spanish class that came and visited for a day. We are grateful for their help in different jobs. There was a group of youth from a university that brought piñatas, ice cream, fruit, cookies, cake, and drinks for the children. It was a fun day with lots to eat. We say thanks. We had our first spelling competition on May 15. It is always interesting to see how much the children have learned. It is also a challenge for the teachers. 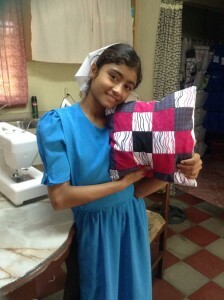 We planned some sewing classes for some of the girls. Already some of them have finished their first projects and are ready to start with something bigger–making their ow n dresses! We want the girls to be able to discover skills and learn things that will be useful in their lives. In the midst of all these activities, I had a gallbladder surgery. We thank God that everything went well. I only need time to recover and regain energy. This is what has been happening in our small place at CICS. 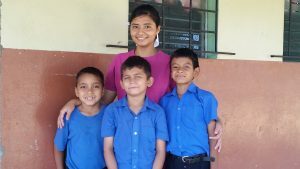 Threads of Purpose is a sewing business created to teach students while giving them a small income.